Kosta Gialamas is an avid Sparta player. We got in touch to find out more about how his Coalition organizes gatherings, and how often they meet outside of the game. How long has your Coalition played Sparta? It was founded on the 12th of June 2014, so we have been playing together for three years and two months. We were a small group at first, but over time we have become much larger and stronger as a team. Our greatest achievement so far is that we have become a group of true friends. How often do you organize gatherings? How many players take part in the gatherings, and from what countries? We get together quite often. Our gatherings are usually small and between members who live in the same city, but sometimes we have much larger ones – this year, for example, many of us met in August. We have also had bigger gatherings in 2015 and 2016. 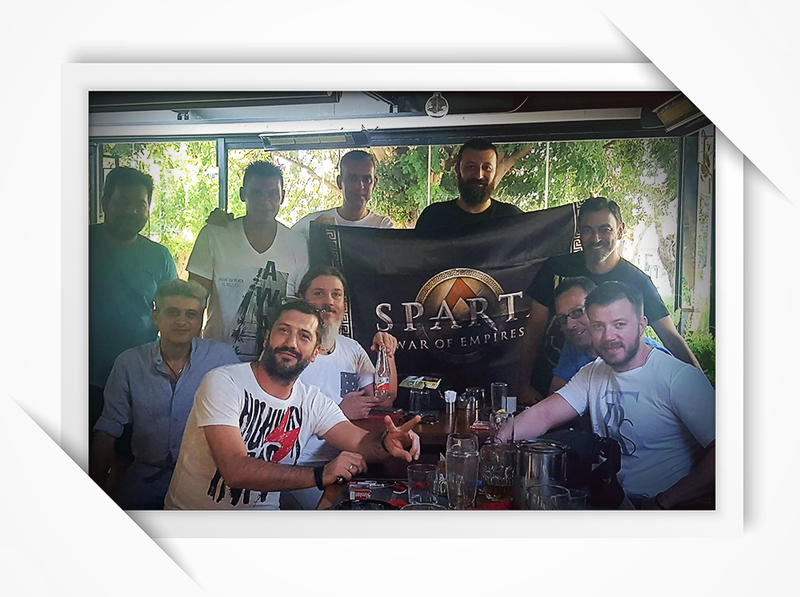 Most of our members are from Greece but we do also have players from Germany, Canada, and the USA. At the last gathering we had eleven members from Greece, and one from Germany. Who is the organizer of your gatherings? How much time does it take to organize a gathering? The team council organizes the gatherings together. We started planning our last meeting about a month before the date, and we knew who was confirmed to join us the week before. Do you like the flag you received? We really loved the flag! It actually arrived in very good time - I received it just before I left for Greece from Germany. Will you organize more gatherings in the future? Our meetings will definitely continue. It seems certain the next one will have even more participation, as most of our players will be enjoying their summer holidays. What advice can you give to players also wanting to organize a gathering? I encourage all Coalitions to try or keep trying to organize a gathering. Even if they have failed before! You become stronger as a group after meeting together face-to-face. I really want to thank all of the Olympian Gods members, both old and new, for all of our team’s achievements. We have become a great group of friends and I promise we will continue our gatherings!